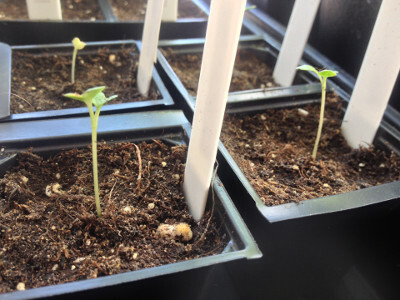 With my tomato seedlings growing, what is the plan? Having not done any gardening since I tried managing an allotment plot, last year I decided to go back to some of the things I grew as a child that can be grown on a patio in containers. The other things I'm thinking of growing are purple sprouting broccoli, tomatoes, cucumber, and mange tout. The reason I am growing strawberries and tomatoes is because they can produce enough fruit for them to be worth growing given the space they take up. The time to break even will, however, take multiple years given the containers and compost I am using. Self-watering containers and good quality compost are ideal for me. As long as they don't die from neglect in the first 12 weeks of going in the containers, it should be pretty hard for me to neglect the plants to death as they won't need watering that often. Tomatoes are, supposedly, one of the easiest foods to grow. Strawberries are also supposed to be "easy" and "spread like weeds" but two thirds of mine died before a single strawberry has been produced. Ease is relative. Tomatoes can suffer from numerous issues, but I'm not going to go into that here. Like with my strawberry plants, I am going to be using Lechuza containers for the other things I am growing. In the case of tomatoes, I will be using the Lechuza Cottage Trio 40. The original plan was to have two planters, squeezing two tomato plants, a cucumber plant, and 9 pea plants into each Trio. The current plan is to put Rose de Berne salad tomatoes in one Trio, Irish Gardeners Delight cherry tomatoes in another Trio, Bijou mangetout in two Lechuza Cube 40, and Wautoma cucumbers in another Cube 40. For the tomatoes, I will be using the Cottage Trio Pedestal to raise the planter off the ground a bit (I'm hoping the uneven paving slabs won't be an issue) and the Trellis to support the tomatoes (although judging by an assembly video on YouTube, I'll probably need a rubber mallet too). The peas are climbers so, given something to climb, will grow upwards. Cucumbers are more of a ground cover and have big leaves, but they can be trained to grow upwards. The brassicas tend to take up a lot of space, and that space is mostly horizontal (i.e. there is wider spacing needed between plants). Tomatoes can grow tall and have a moderate spread. Growing different plants in the same place the same year. Growing different plants in the same place at the same time. Companion plants can be grown in the same place, either without causing detriment to each other or being beneficial to each other. Some plants can be grown together at the same time. Tomatoes, for example, lose their lower leaves as the season goes on, and the first trusses of flowers to open are lower on the plant. Once those tomatoes are picked the leaves below them are supposedly less important. With a lot of bare space below the leaves of a tomato plant, that area can look at a bit bare. A large 40 cm square container with a single stem in the centre of it will also have bare looking soil. With 6 such containers, that is a total width of 2.4 metres (7 feet 10½ inches) of soil with just 6 stems at soil level. In the first Cottage Trio (the one with the Rose de Berne salad tomatoes) I will grow 12 clumps (multiple seeds per cell) of Feast salad onions, if they germinate. In the left-most insert I'll grow french marigolds and cos lettuce at the front, with lettuce and marigolds in the front of the middle insert, and marigolds and basil in the front of the right insert. In the second Cottage Trio (the one with the Irish Gardeners Delight cherry tomatoes) I will grow 12 clumps of Feast salad onions (if they germinate). In the front of each insert I will be growing the mirror image of those in the first Cottage Trio. The Cottage 40 liners have an internal width and breadth of 34.5 cm (minus the space used for the water level indicator). They also have a 31 litre soil capacity, a 7.5 litre water capacity, and a 28 cm internal depth. 34.5 cm is approximately 13½ inches, so in the case of the "back" row (salad onions) the clumps will be approximately 5½ inches apart, and 2¾ inches from the back and side of the liner. So, although growing 6 tomato plants will take up a lot of space, with companion planting I will be growing salad tomatoes, cherry tomatoes, salad onions (hopefully), basil, lettuce, and some French marigolds. Next year I will probably grow some red onions from seed, but it is too late to start them from seed this year. The salad onion seeds might not germinate at all, in which case I will grow more marigolds and/or lettuce in their place. 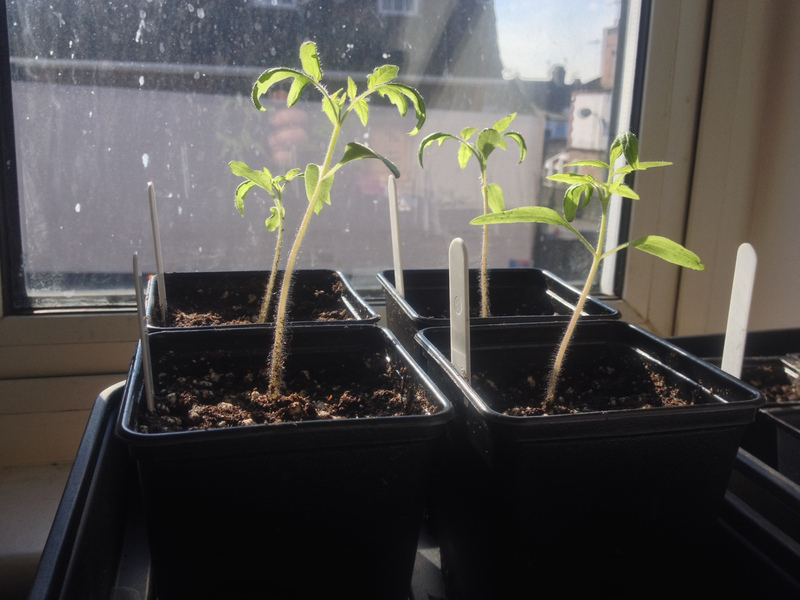 I started the tomatoes from seed mid-March (about 6 weeks before last frost date in Watford) using my old seed from 2010/11, making the seed 5 years old. Tomato seeds have an expected life of 3 years. The germination rate of the Rose de Berne salad tomato cultivar was 100%. 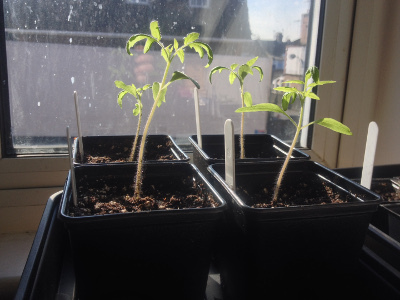 Only one of the Irish Gardeners Delight cherry tomato cultivar sprouted so I added an extra seed to the other 3 pots, two of which sprouted. The Irish Gardeners Delight, therefore, had an approximate 43% germination rate. I am therefore going to assume that cherry tomato seeds have a shorter shelf life than salad tomato seeds, although this is based on unscientific results with a very small sample size. Approximately 2 weeks after the Rose de Berne cotyledons broke the surface, the first set of true leaves were at least half an inch long. At this point I transplanted them from their 6 cm pots to 9 cm pots. 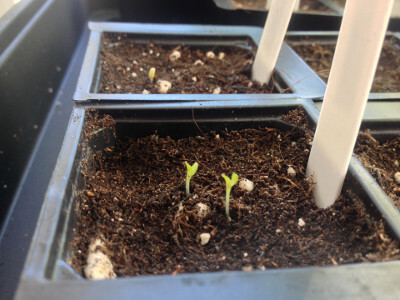 It took the first Irish Gardeners Delight seedling another week or so to reach that point, and the seedlings started later took a week longer than that. I prefer square pots for seedlings as they take up less space and in the unlikely event they fall over there isn't any chance of them rolling (which could potentially cause more damage to the folliage). 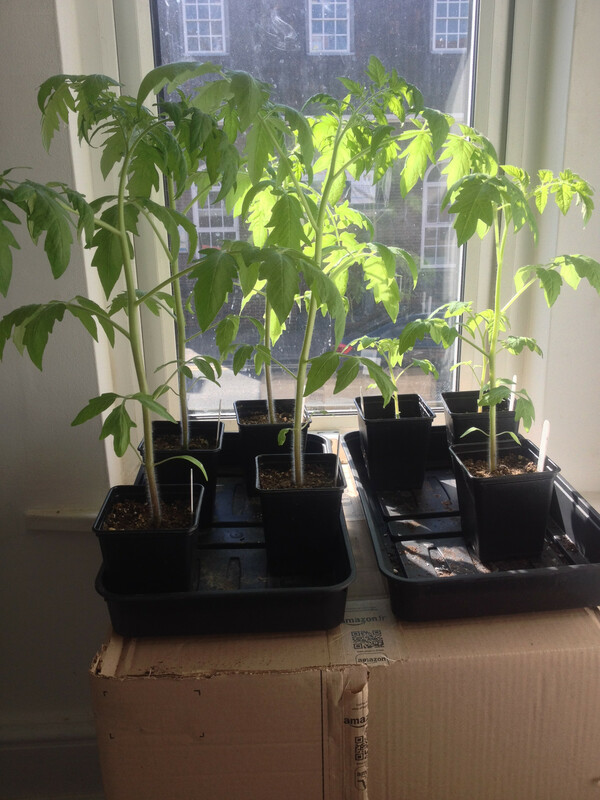 Unfortunately, the plants are now getting rather big and it is still a few weeks before they can be moved outside. The Rose de Berne seedlings and the larger Irish Gardeners Delight seedling went outside for 40 minutes today in a partially shaded area as the last frost date here is the last week of April and so I have started to harden them off. The smaller Irish Gardeners Delight seedlings will start to be hardened off in another week or so. Amazon have sold out of the Cottage Trio 40 (granite colour) which means I only have the one I bought in December. They don't know when they will have more in stock, which could be a problem. So far, some Bijou mangetout, Crisp Mint lettuce, late purple sprouting broccoli, and early sprouting broccoli have germinated. I haven't started French marigolds yet (Petite Mixture cultivar), and neither the Golden Sweet mangetout or the Wautoma cucumbers have shown signs of germination yet. The Feast salad onions look like they are going to have close to a 0% germination rate, and given how difficult onion seed saving is and the short seed life I probably won't try growing onions next year… I might try growing some chives though if I can find somewhere they could be grown. The basil hasn't germinated yet either, but the seeds were only sown in cells/pots on the 20th (11 days ago) so it might just be a waiting game. Soaking the Bijou mangetout for a couple of hours and sowing them in individual cells in an unheated propagator seems to have resulted in germination in only a couple of days. 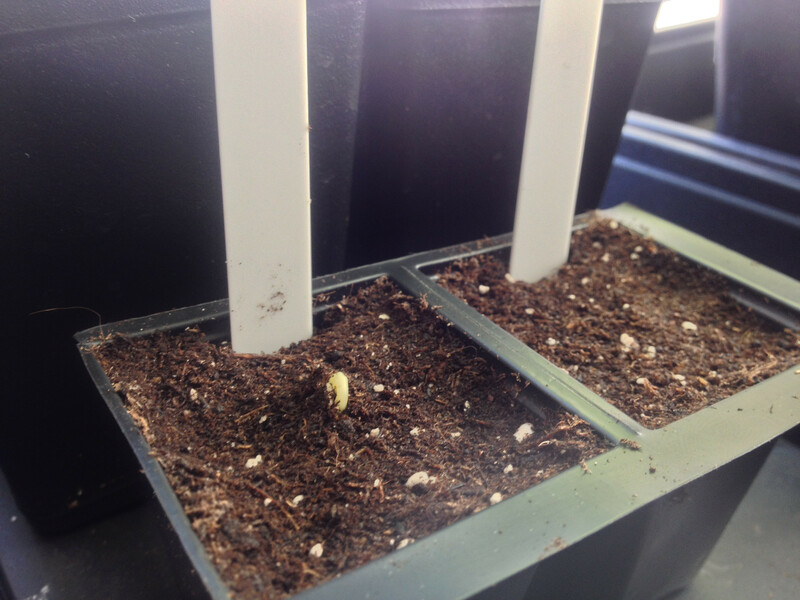 I am likely to lose one seedling, however, because the root went through the hole in the pot and got damaged (cotyledon hasn't broken the surface yet either). I have set up a Cottage 40 Cube ready for the Bijou mangetout which will be transplanted when a couple of inches high. I will be squeezing 18 seedlings into that approximate square foot, using a tomato cage with three sides (triangular) with 19 mm mesh for the peas to climb. 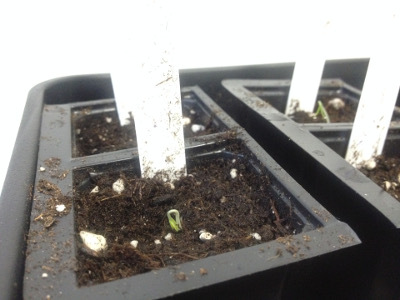 Although the Golden Sweet mangetout hasn't germinated yet, I am sure it will eventually, especially now that the weather is warming up a bit. Posted by John Cook on Sunday, 1st May 2016 .